Happy Monday to you all and welcome to Flawed yet Functional! I am an adult-onset, Type 1 Diabetic managing my blood sugar through insulin and the Autoimmune Protocol diet. 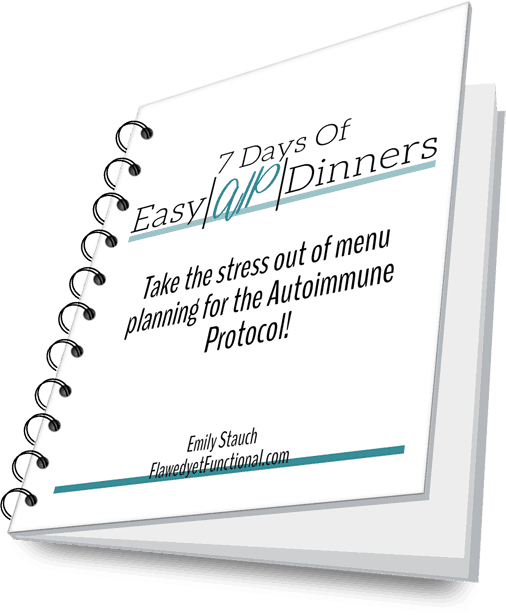 As with any diet that’s worth its salt, the Autoimmune Protocol is heavy in vegetables. I easily fall into a rut when fixing vegetables for dinner, so I challenged myself to create a new, intensely flavored roasted vegetable. I included all the AIP approved spices that have an Asian/Indian flair, and it turned out delicious. Try Turmeric and Garlic Roasted Butternut Squash with your dinner tonight! My sister and her husband took a trip to Turkey a while back, and a huge memory they brought back was the intensely seasoned and flavorful food. So much flavor! Her husband, wanting to recreate the magic of Turkey, tried to amp up one of their usual American dinners and doubled or tripled the seasoning. I’m talking 2-3 tablespoons EACH of various spices. Guess what? It was awesome. This little story inspired me to be more daring with my dried seasoning. If one teaspoon is good, why not see what 2 or 3 is like? Let me tell you, many of my go-to recipes have become so much better. In the spirit of MORE SEASONING, I bring you this tasty side dish. Don’t shy away from the seasoning. The cubes of squash will be very well covered, but it won’t be spicy or overpowering. It is simply delicious. PSA: You need a very sharp knife in your kitchen. If not for your own safety and ease of chopping, you need one to cut squash. Squash is an extremely dense vegetable, and a properly sharp knife will slice through it straight, not veering sideways and potentially cutting you. Get a sharp knife. PSA aside, here’s how to prepare a butternut squash. Peel the entire squash with a vegetable peeler. Cut off the top and bottom. Slice in half the length of the squash. Scoop and scrape out seeds and seed membrane from the bulb area. Slice then chop into cubes. The hardest part of this recipe is preparing the squash. Now, the easy part: mix all the seasoning and oil then roast in the oven! Finishing up this delicious side dish is very quick and easy. Do not stir the squash halfway through! I know many roasted vegetable recipes will tell you to do so, but I love the crispy charred bits from the bottom of the pan. Stirring will make those blackened bits harder to form. Another perk is less babysitting! Just set a timer for 30 minutes and work on the rest of your dinner worry-free while this dish is cooking! If you usually shy away from a lot of seasoning, pair this vegetable with a more tame main course like grilled chicken or hamburgers. Let the roasted butternut squash shine and the other dishes compliment rather than compete. Roasted vegetables are a daily if not meal-ly (is that a word??) occurrence at our dining table. I’m getting good at variety while still keeping the basics of roasting vegetables the same. If you enjoy savory dishes, I know you will love this turmeric and garlic roasted butternut squash. Try it tonight! Extra seasoned roasted butternut squash is a flavorful addition to your dinner plate! AIP and Paleo-friendly, this is sure to meet your dietary requirements and please the whole family. Dairy-free, nightshade-free, and gluten-free! Preheat oven to 475° and line a rimmed baking sheet with parchment paper and set aside. Prepare butternut squash by peeling, cutting in half, scooping out seeds, then slicing and cubing. Add butternut squash to a large mixing bowl and add olive oil, sea salt, garlic powder, ginger, onion powder, and turmeric. Stir to coat evenly. Add more oil as needed to cover all sides of the squash with seasoning. Pour squash onto prepared pan and spread out in single layer. Roast at 475° for 30 minutes or until squash is tender and browning.